This past Saturday we had the MOST FUN PARTY ever, for no reason at all. 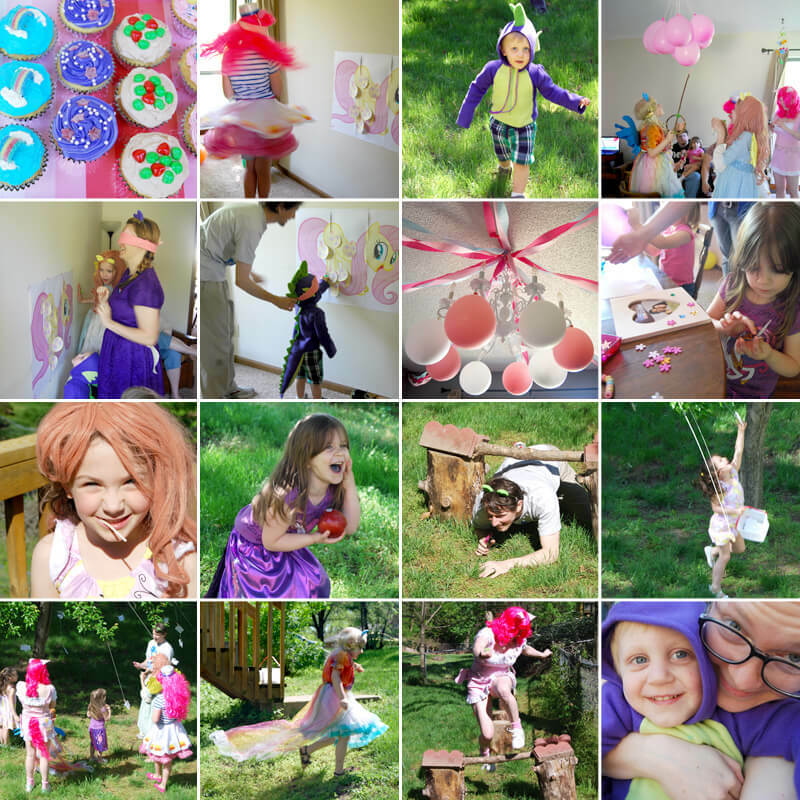 We are big Friendship is Magic fans in our house, so we thought it would be fun to throw a Grand Galloping Gala party and invite all of our pony-loving friends. It was ridiculous amounts of fun. Everyone came dressed up, I loved all of the costumes. 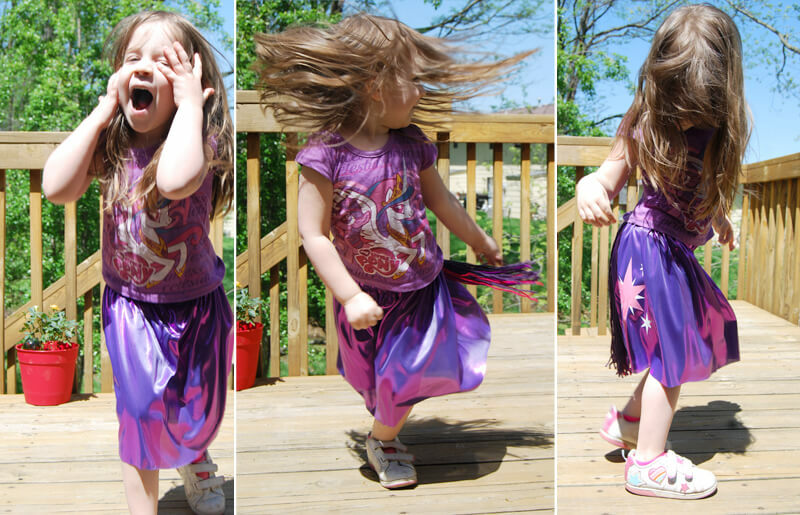 I made a simple Twilight Sparkle skirt for Juniper, and Flynn wore the top from his Spike costume. Now, in my opinion, the best part of planning this party was definitely the cupcakes!! Shaun and I had so much fun at the candy store trying to pick out the perfect topping for each cupcake. Flynn ALSO had fun at the candy store. (Obviously.) For some crazy reason, I started decorating these around midnight and we didn’t get to sleep until after 3! It was worth it though, I love them. 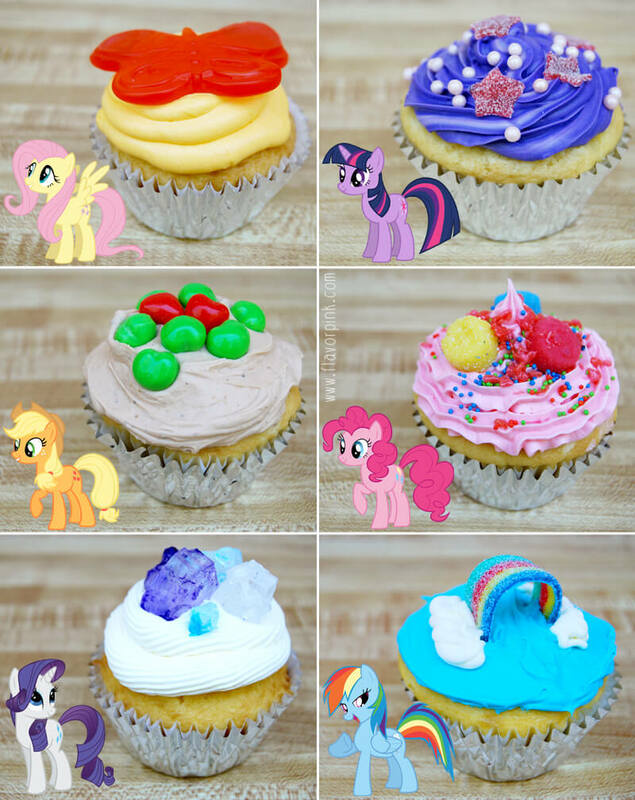 So each pony got their own cupcake AND their own party game. Shaun and I had a bit too much fun planning out this party. Twilight Sparkle – “To Do List”: This was basically a scavenger hunt, but Shaun wrote up a letter from Twilight saying that Zecora was teaching her how to make the cure for Poison Joke and she needed help finding all of the ingredients. It turned out so cute. Shaun is such a Bronie, haha! Apple Jack – We set up an obstacle course through our backyard. The kids had to weave through some stumps, jump over (or climb under) a hurdle, jump through a hula hoop, pull the clothes line across the yard and grab a ball, then they had to run over and kick one of our trees making an apple fall out! Pinkie Pie – We were going to do a Pinata for Pinkie Pie, but instead we make a Balloon Pop game. We filled balloons with prizes, and took turns popping a balloon. It worked out a lot like a pinata, only every one got to “break it open”. More fun! Rarity – I bought a dozen wooden craft frames and everyone got to decorate one with craft gems, foam stickers, markers and washi tape. Rainbow Dash – Cloud busting!! Shaun hung a bunch of strings to our pear tree with clothes pins tied to the ends. He cut cloud shapes out of card stock and stuck one on each pin. The kids took turns running around grabbing all of the clouds while Shaun timed them. This game was a huge hit! All in all, it was seriously the most fun party we’ve ever thrown. The kids (and adults) all had a blast. Juniper was SO EXCITED the entire time. Oh my goodness was she adorable. I think we should have random parties more often. May 13, 2013 in Holidays, Kids, Life, Tutorials / DIY. Her face in EVERY photo shows that she WAS excited the whole time! Thanks for writing this because I had so many questions! I must say, this pony love is impressed!! At first MLP was all about my daughter, but I love it just as much as she does now! (you can tell because I’ve banned her from playing my iphone app game, it’s MiiiiiiNE!!!!) lol I think we need to have an impromptu pony party too, thanks for sharing! ps your daughter looks like her face is gonna melt from excitement. so cute. Haha! I definitely play the MLP game on my phone more than my daughter But I’ve got to say, my husband is the biggest fan in our house and it is hilarious. Have a random pony party!! It was so much fun! What candy did you use on all the cupcakes? A couple of the pictures I can tell but others I can’t. My daughter saw your post on Pinterest while we were getting ideas for her birthday, and she wants your cupcakes to go with her garden cake. We had fun picking out all of the candy for the cupcakes, at the bulk candy store at our mall. Here is what we used, but really you can use anything.